After waiting for our gate to open we finally saw the words on screen we had wanted to see all afternoon, ‘go to gate’ I proclaimed! Of which the girl sat next to me finished my sentence with ‘5, go to gate 5’. Personally the thought of flying can make me quite anxious so knowing I was on the way to the gate gave me a sense of relief… All the hanging about at airports gives me the time to worry. However, at this point Elle and I were totally unaware that this relief would soon be replaced by numerous days of stress. Once at our gate we joined a massive queue which seemed to be going…nowhere! Eventually, at least half an hour later a fellow passenger walked past and revealed our flight was in fact cancelled due to a technical fault. Firstly of course that’s fair enough I would not want to get on any plane with some sort of fault, however the Emirates staff at Heathrow were simply diabolical; lacking any sense of customer service… I mean come on just a simple announcement to tell us the flight was cancelled & that we were queueing in order to be transferred onto a later flight isn’t that hard to do? Apparently so for Emirates. So our adventure began with sitting on the floor in a queue for nearly four hours; only bonus was that they were handing out free drinks and snacks very occasionally. 3/4 hours later: FINALLY we’re front of the queue… BUT just our luck the air stewardess tells us we are the first people they cannot fit on as there were no more seats on later Emirates flights. Brilliant, by this point it was becoming a complete joke. In the end we were transferred onto a Qantas flight to Sydney but stopping at Dubai, which meant literally nearly running to the gate to get on it so last minute. But at least we were finally up in the air ready to enjoy our time in Dubai, blissfully unaware of the further drama that would follow. We arrived to Dubai 9am, originally we were due to land 3am and therefore had booked that night in the hotel… Money wasted! As we stood by the baggage belt for a good while doubt started to creep up in our minds which was confirmed when a man came up to us and a group of people that had also originally been on the cancelled flight to tell us that there were no more bags for Dubai. WHAT! There we were in temperatures of 28 degrees and above with just a pair of leggings, a tshirt and a hoody… Great. This also took up more of our time we should have had in Dubai by filling out paperwork to report the bags missing. The staff at Dubai airport gave us the impression that our bags would get to us later that day, but actually we were without our luggage for the majority of our time in Dubai. 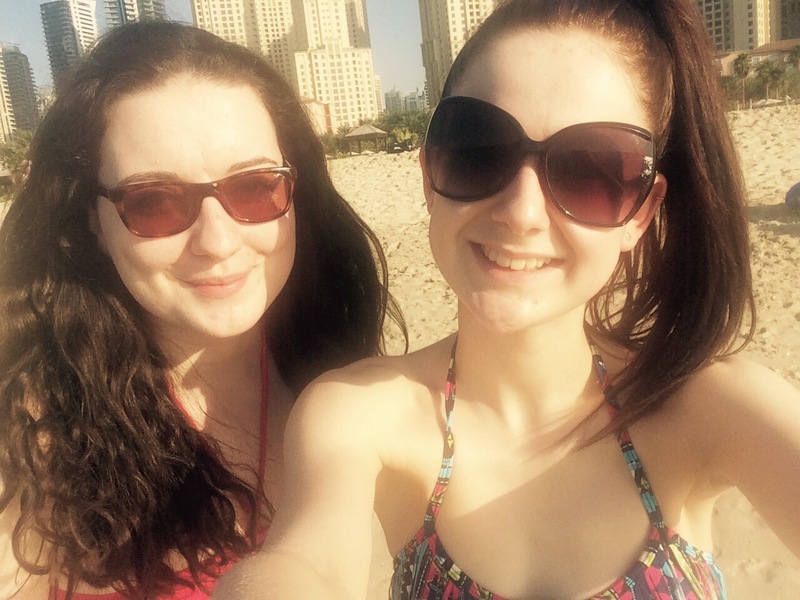 On a more positive note, Dubai is amazing, I loved every moment of being there (minus the no clothes situation)! It is so hard to describe but I loved the general feel of the city. The buildings are so impressive and the Dubai Mall is incredibly huge with hundreds upon hundreds of shops, but also has the tourist entrance to the Burj Khalifa and the worlds largest aquarium inside! Because we had no clothes we decided to head to the Dubai Mall on our first afternoon; you could spend a whole day and more in this place it is that big! 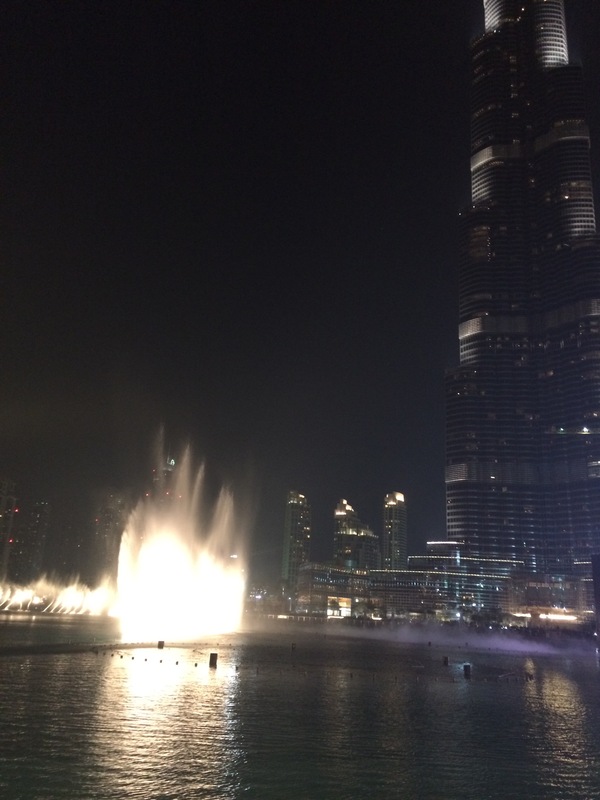 From 6pm every evening there is a fountain display outside the mall every half an hour in front of the Burj Khalifa, it was spectacular! As well as the fountains, the Burj Khalifa behind looked absolutely stunning lit up in the dark. Following this we went to a Chinese restaurant at the mall which had a balcony overlooking the displays; loud music would play and each time the display was different – it almost looked like the water was dancing! The staff at the restaurant seemed to really like us, they gave us two lots of prawn crackers for free before we’d even got our mains, and to top it all off they gave us a free dessert which was different… But good! It was ice cream in the middle surrounded by a type of fried waffle. The funniest part for me personally was when we left the balcony and walked through the restaurant to go they were playing the song ‘Good Riddance, Time of your life’ by Green Day. The reason it was funny was because earlier on in the night one of the waiters asked me what song my wrist tattoo was so I told him… I actually think they played it on purpose !! On our first full day in Dubai we still had no luggage despite being told we would have received it by this point… Grr! So again we basically had to spend most of the day inside. Mall of the Emirates is another big shopping mall so Elle and I headed there first thing in the morning. Inside is the biggest indoor ski slope; Ski Dubai. It was really cool to watch from the window as there were also people doing ringoing and zorbing, and a Frozen themed area for children! We decided to eat at the St Moritz Cafe by the windows of ski Dubai but the freezing cold temperatures from inside meant we had to move away. In the afternoon to went to Dubai Mall Aquarium tunnel and Underwater Zoo where we met the biggest crocodile ever called King Croc. 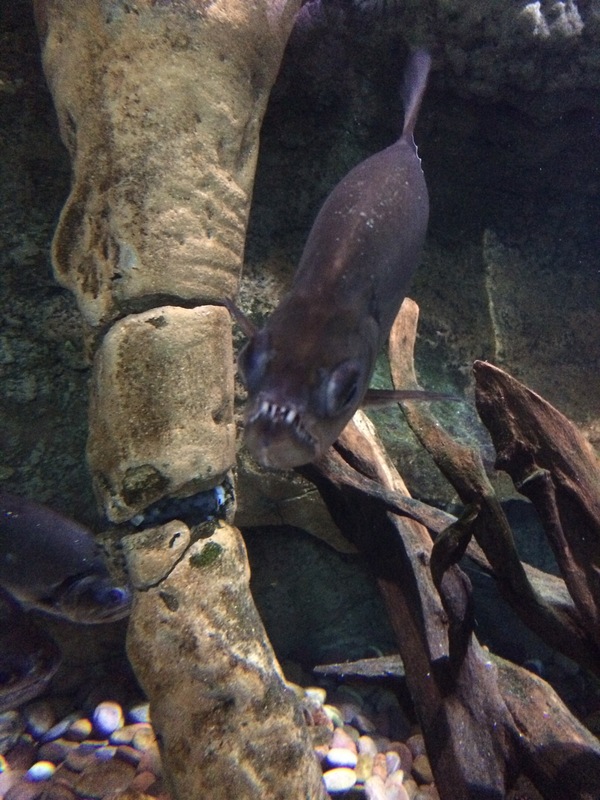 My favourite part though was seeing all the crazy looking fish and most of all I loved the piranhas! I just find them so entertaining with their teeth; I even filmed one looking angry at me, kind of strange that of all the things we saw, they were my favourite. Later in the evening we went to see the Burj Al Arab which is a hotel with restaurants designed to look like a ships sail. In the evening it is lit up and looks so impressive, as does next door; the wave hotel aka Jumeriah Beach Resort (very posh). On our final full day in Dubai our luggage FINALLY arrived!! 6am came when the phone next to my bed began ringing; it was reception telling me my bag was at last in Dubai! However unfortunately Elle’s wasn’t going to arrive until between 12-1pm. It turns out Elle’s luggage went to Sydney…& mine; well they didn’t know where mine was so I reckon it never left London. Once we got ready and finally felt properly clean for the first time in days we headed down to Marina beach and soaked up some rays. Then we went on a bit of an adventure with a taxi driver who drove us on to the Palm so we could see the amazing buildings on it. It wasn’t what I expected… For some reason I just pictured sand everywhere when in fact it is just like the rest of Dubai with main roads and high buildings. Nevertheless very impressive. Final day: Burj Khalifa, Fly to Bangkok! 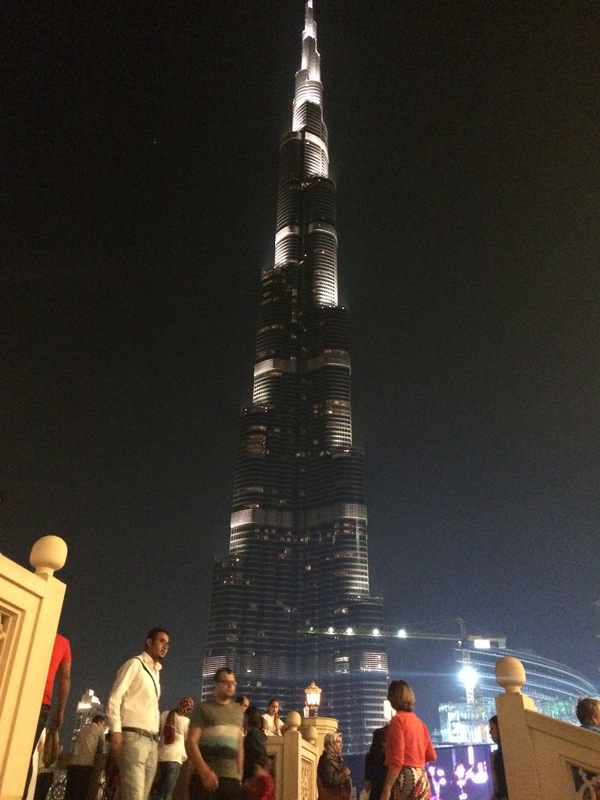 Friday came and our flight to Bangkok was later that afternoon, however there was still one attraction left to do that cannot be missed in Dubai; going up the Burj Khalifa – the worlds tallest building! The lift speeds up to the viewpoint so quickly it is insane how fast it goes for the height you reach! Once you step out onto the outside viewing area you are surrounded by beautiful views of Dubai including in the far distance ‘The World’ islands – Dubai’s most recent construction project. Being above all the skyscrapers really makes you realise how tall the Burj Khalifa is. 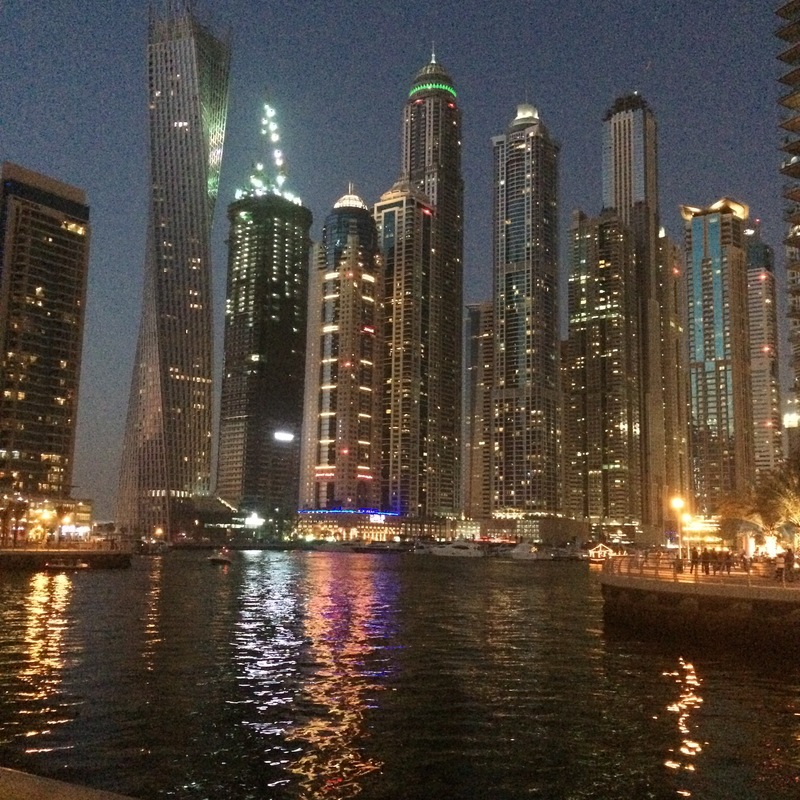 I would really recommend visiting Dubai, everything about it is just astounding to see, and I will definitely be visiting again in the future… Hopefully next time with some clothes!